These 3 things are all slightly different; “Open Data” is a policy; “Linked Data” is an approach and “RDF” is a data structure. 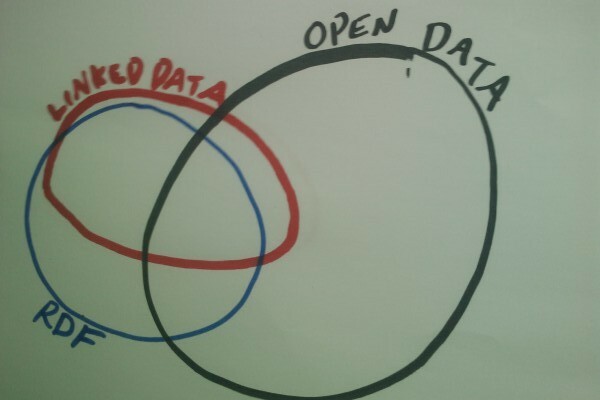 Open Data: Open data is data which you can use more or less freely. It’s generally available on the web, and uses non-proprietry formats like XML, CSV. An extremist definition is data with a clear copyright & an open license (which allows commercial reuse), available from a URL or a well documented API without any restrictions, in formats which are completely open (ie. no patent concerns etc.) A milder definition is “available as data on the web in a form people can do stuff with”. Some Open Data is also Linked Data and RDF, but probably less than half. Linked Data: Linked data is data which contains links to other datasets. Generally these will use URIs which are resolvable to discover more facts. It’s not essential for the URIs to be resolvable, it’s still really useful to have two different datasets which have used the same identifiers. URIs are unambiguous. However, some data doesn’t make much sense to link up, or the costs are too high and put people off. Linked data is often open, but doesn’t have to be — for example you can have internal confidential data which links up with other data sources. A good example is a lecture timetable; which is confidentidal to the student, but links to data about rooms & modules which are open. Almost all Linked Data is currently expressed in RDF, but you could have links in XML, KML, CSV etc. it’s just RDF is designed with linking in mind. RDF: RDF is a useful data-structure for creating interoperable data. It has a number of file formats for exchanging this data. Most common is RDF/XML. Nicest (in my opinion) is Turtle. Simplest is N-Triples, where you just write out the data one fact per line. You can also express RDF data embeded in HTML as “RDFa”. The structure of RDF makes it trivial to merge data from multiple sources — it’s all triples. Also it assumes that you will want to either link the data yourself, or other people will want to link into your data. You can publish RDF data which becomes linked data as other people link to it, just like publishing pages on the web. RDF is just a way of structuring data and as such is not always open and not always linked. Linked Open Data: (aka LOD) is a common term, and as you can see is usually going to be in RDF too. The key thing is not to get put off by the linking. Add links when they provide value to your data and will help people using your data (yourself included) do more with it. Posted in Data, RDF, Tutorial. 1-3 Stars = Open Data. 4 Stars = Open Data + Data in a linkable structure, almost always RDF. 5 Stars = Linked + Open Data, almost always RDF. Like all models, RDF has its issues. That is not a reason to dismiss it, but it may be part of an ecosystem. Nice explanation. Just 2 cents: In my experience, sometimes it helps to call “Linked Data” “Linkable Data”, which IMHO is more correct and emphasizes that the actual linking is not a prerequisite for Linked Data. In that case, you could put RDF completely inside the (bigger) Linked Data circle. @KAI, I think the important difference between “linkable” and “linked” data is that a dataset that has indeed been “linked” is much more usable and therefore valuable to “consumers” — data users, such as mashup developers). In particular, a government dataset that has been “enhanced” by linking values to canonical entity URIs provides much more value to application developers. But such “reconciliation” is only one way to increase the quality of the linked data. Nice explanation of the three forms of data. Unlike John, I feel that RDF Data is NOT a subset of Linked Data. The primary reason is that you can have a completely closed and non-dereferenceable network of RDF Data (and there is quite a lot of it out there). I am very pleased though that you highlighted Linked Data as being data that isn’t in the RDF framework. All sorts of things can be Linked Data, as you say, CSV, XML, XML, even plain old XHTML. Very nice short article, well done! URIs needn’t *resolve* for it to be Linked Data — but they must be *resolvable*. In other words, when you mint a URI, they MUST be valid, and you MUST be able to dereference those URIs — even if you get a 404 or other disappointing result when you do so. Yes, sometimes serving that data up is too expensive *today* — but that may change, and if the URI is *resolvable*, you can put the data up when it *is* worth the cost. If the URI is *not* resolvable, then it becomes a dead-end for all concerned — and that’s no way to Link your Data. Agreed. Define clean URIs in your namespace, make them resolve in 5 years time when you finally see that there’s a return-on-investment for doing so. I’m planning to give a talk next week on when not to link your linked data. Basically, to tell people that they should do as much as seems of value to them. If they can’t see the value in linking, yet, don’t just make links for the sake of it. I’m very keen to get some standards bodies to bless URIs in their namespaces, even if they don’t make them resolve… eg. the UK UCAS codes would be dead useful. Thanks for the simple clearing up of this for me. If nothing else it helps me when searching for more info, by using the correct terminology. I agree that linked data (lowercase!) refers to a structures and mechanisms that do not need RDF. There are other ways out there to implement linked data. There were, and are, also other ways to publish documents on the web. The reason we have The Web is that HTML + http is what everybody uses. If we want to have not just islands of linked data out there, but a Linked Data Web, then we need to have linked data fully within RDF.